One of the many negatives of having bad credit is that it frequently makes things much harder than they would be otherwise. For example, finding a mortgage lender with good credit can be like catching fish in a barrel — everyone likes a good-credit borrower. However, finding a bad-credit mortgage lender is more like fishing the ocean with a worm and a string; it’s going to take a lot of patience to catch anything. In general, bad-credit borrowers won’t qualify for a conventional loan, and they will be limited to government-insured mortgages including FHA, VA, and USDA loans. So, if you’re looking for a mortgage with bad credit means finding a lender that offers the specific type of government-backed loan for which you’re most likely to qualify. The most common type of housing loan available to bad-credit borrowers are loans backed by the Federal Housing Administration, known as FHA home loans. These loans are insured by the FHA, which significantly reduces the risk to the lender and allows for reduced credit and down payment requirements. Although FHA loans are lower risk for lenders, they can be more complicated and involved to issue and manage, so not all lenders will offer FHA loans. Additionally, each lender can set its own rates, fees, and qualification requirements, so you may need to shop FHA lenders to find a good fit. Quicken has long been a trusted name in home mortgages, and the online lending network offers a full range of loan products, including FHA, USDA, and VA loans. The minimum credit score for an FHA loan is 580, while USDA and VA loans will require a higher 620. Quicken’s Rocket Mortgage product allows users to apply for a mortgage right from their computer, tablet, or phone. Low or no down payment required; flexible credit guidelines. Seller can contribute up to 6% of sales price. Streamlined refinance programs that speed the closing process. Closing costs can be rolled into the loan. Opportunities Within Neighborhoods (OWN) programs offer low down payment options, flexible credit criteria and other attractive features to meet the needs of many low- and moderate- income borrowers and those purchasing homes in low- and moderate - income areas. Citi is one of the largest banks in the U.S., providing traditional banking products as well as a variety of home loans. The bank can work with many credit types for FHA, VA, and USDA loans, with no published minimum credit score requirements for any of its home loans. Borrowers can apply for pre-approval to get an idea of whether they’ll qualify for a given loan. Vylla is a house-hunting site and direct lender all in one. Users can search available homes directly from the Vylla site, then fill out a loan application without skipping a beat. The lender offers a range of loan types, including FHA, VA, and USDA loans. The minimum credit score requirements for a Vylla loan will vary by loan type, with a credit score of at least 500 required for an FHA or VA mortgage loan. After closing, users can manage their loan easily through the Vylla website or mobile app. The rules set by the FHA for its insured loans specify a minimum credit score of at least 500 to get a mortgage with a 10% or higher down payment. The FHA requires a credit score of at least 580 to make a smaller down payment, with a minimum down payment of 3.5%. FHA borrowers are also subject to restrictions on their outstanding debt, with a maximum debt-to-income ratio (your monthly debt divided by your monthly income) of 43% for applicants with credit scores of 580 and up. Similarly, your monthly housing debt cannot exceed 31% of your monthly income. At the same time, while FHA loans have very low qualifications, individual lenders can set their own requirements for both credit scores and specific down payments. For example, an individual lender may only offer FHA loans to applicants with credit scores above 580. Additionally, all FHA-backed mortgage loans will include some form of mortgage insurance. This is an extra amount added onto your mortgage payments that help protect the lender against default if you should become unable to repay your loan. Eligibility for a loan insured by Veterans Affairs is one way that the government helps show appreciation for its military members and service veterans. VA home loans have low credit requirements and no minimum down payment amount, making them easier to qualify for than traditional loans. Many of the FHA lenders from the section above will also offer VA loans with very low credit requirements. Additionally, check out the deals offered by any of the many lenders, banks, and credit unions that specifically cater to military members and veterans, including the two below. Veterans United is a lender that specializes in VA-insured purchase and refinance loans. Most applicants will need to meet the lender’s minimum credit score requirement of 620, but qualified applicants can take advantage of the lack of a down payment requirement. If your credit isn’t in good enough shape to qualify for a Veterans United mortgage, you may be able to join the lender’s Lighthouse program. The program can help users build and repair credit to become eligible for a loan. Navy Federal is a credit union that caters specifically to military members and veterans. The credit union offers both new purchase and refinance options, including 100% financing loans with no down payment requirements. Because Navy Federal is a credit union, you will need to be a member to get a loan from the institution. Potential borrowers may want to consider joining in advance of their mortgage quest, as members with solid banking history may get a boost when they apply. The specifics for meeting the qualifications of a VA loan will depend on when and how you served. Eligibility requirements vary between active duty during wartime and service during peacetime, as well as special requirements for servicemembers who received a discharge for a service-connected disability. Before you start shopping for a VA loan, you’ll need to obtain a Certificate of Eligibility that verifies that you meet the service requirements for a VA loan. You can apply for a Certificate of Eligibility online through the VA website. As with other types of government-insured loans, VA loans don’t have a minimum credit score requirement, but individual lenders can determine their own standards. Additionally, don’t think you won’t qualify due to a recent bankruptcy; you can qualify for a VA loan as soon as one year after filing Chapter 13 bankruptcy and two years after a Chapter 7 discharge. In addition to the lack of a down payment requirement, VA-backed loans vary from FHA loans in that VA-insured loans won’t require you to take on and pay mortgage insurance. At the same time, some borrowers may be required to pay a funding fee, but the funding fee can be included in the mortgage. Loans insured by the U.S. Department of Agriculture may seem less intuitive than those backed by the FHA or VA, but it makes more sense when you know that USDA loans are intended for homeowners in rural areas who lack safe housing. USDA-backed loans are a little less common than their other departmental counterparts, but many of the same lenders that offer FHA and VA loans will also work with borrowers eligible for USDA loans. We’ve highlighted two such lenders below, but the USDA also provides a list of approved lenders (PDF). New American Funding provides a large variety of home loans, including USDA-insured mortgage loans. The lender uses a manual underwriting process to ensure each application gets a fair and complete evaluation. Potential borrowers can start the pre-qualification process online and receive a pre-qualification letter after chatting with a lender representative. New American Funding operates in most states, but cannot provide services to residents of New York or Hawaii. J.G. Wentworth is a financial company with a range of loan products, and the lender has years of experience with USDA-insured home mortgage loans. The lender advertises low turnaround times and a streamlined application process that makes getting a loan simple. Borrowers can apply for their loan online and go through the complete loan process without heading into a branch. J.G. Wentworth cannot process loans for residents of Hawaii, Missouri, Montana, Nevada, or New York. USDA-insured home loans are specially designed to help homeowners in rural areas; as such, any property must be located in an eligible area to qualify for a USDA loan. However, the definition is fairly loose, with the term rural generally translated as meaning areas of low population density. You can check to see if a given property is located in an eligible area by using the USDA’s online tool. Applicants must also meet the USDA income eligibility requirements. These limits will vary based on your state and county of residence as well as the number of people in your household. In addition to the ability to use USDA loan funds to purchase a new or existing property, borrowers may be able to use funds to perform repairs or rehabilitation of an existing house, or to purchase and/or install measures that promote energy efficiency. Another popular feature of USDA-insured loans is that, while they do still require some mortgage insurance for no- or low-down-payment homes, the insurance rate is lower than the rates with other types of home mortgage loans. One of the main reasons people consider buying a home to be an “investment” is that property often (but not always) appreciates — i.e., grows — in value over time. Even without a lot of appreciation, your equity in your home will grow as you pay down your mortgage loan. The equity that you build in your home has real value, and, when in a bind, you can use that value as collateral to get cash out of your home. The two main ways to cash in on your equity is through either a home equity loan or credit line, or through a cash-out refinance loan. Most home mortgage lenders will also offer refinance and home equity loans. Keep in mind that using your home as collateral puts it at stake; if you stop repaying your loan, you could lose your property to foreclosure. A popular online lending network, LendingTree connects borrowers with direct, bank, and peer-to-peer lenders for a variety of loans types, including refinance and home equity loans. While LendingTree itself has no minimum credit score requirement, its lending partners will set their own credit, income, and equity requirements. Network Capital is an online lender that provides a number of different types of home loans, and borrowers can find both regular and cash-out refinance options. Borrowers don’t pay separate lender’s fees, but they will be responsible for any third-party fees. Loans can close in as few as 15 business days in some cases. Network Capital does not operate in all states; check the lender’s website to see if you live in a state that qualifies. The most common type of refinance loan — a straight or streamline refinance — is probably less-than-helpful when you have bad credit. The key to that type of refinance is getting a lower interest rate, and that is simply not likely to happen if your credit is poor. If you’re in need of cash, however, and you’d like to use your home’s equity as collateral for a loan, then you may have some options. The quality of those options will depend on your actual credit profile and the amount of equity you’ve built in your home. In general, there are two main ways to get cash from your home: a cash-out refinance loan or a home equity loan/credit line. The former is like a regular refinance loan — you take out a new mortgage loan and pay off your old loan — but instead of the loan being for the amount you owe on your current mortgage, you can take out a larger loan based on the value of your house. The difference between what you owe and the amount you borrow is then yours to do with as you need, such as paying off debt or making home repairs. Be cognizant of the length of your new loan, however; don’t extend your payoff time unless you absolutely have to, as the longer it takes to repay your loan, the more the loan is going to cost you overall. The other option is a home equity loan or credit line. Home equity loans are also sometimes called second mortgages, as they are loans that use your home as collateral, but they are separate from your existing mortgage. A home equity loan is a one-and-done deal; once you pay it off, the contract is complete. A home equity credit line (HELOC) is reusable; you can pay it off and then use it again. 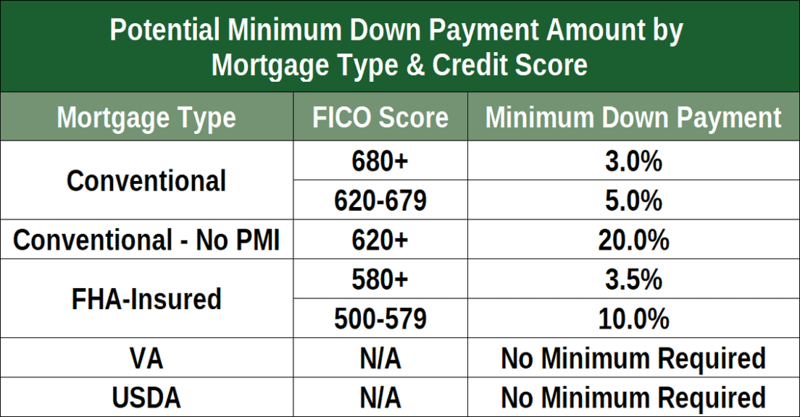 What is the Minimum Credit Score for a Conventional Mortgage Loan? Fair or not, your credit history and scores are used by all kinds of folks to judge both your credit risk and your general financial state. Unfortunately, in most cases, the specific scores that will get you through the door are rarely published by the parties that use them, making it hard to know where you stand. One of the few exceptions to this unspoken rule is the conventional mortgage — or, at least, most of them. While lenders are allowed to set their own requirements for credit scores and down payment amounts for a mortgage loan, they tend to stick to the standards set by Fannie Mae and Freddie Mac. As many homeowners can attest, the company from which you get your original conventional mortgage loan will rarely stay the same throughout the life of that mortgage. Instead, many lenders will sell your mortgage debt, often to government agencies like, you guessed it, Fannie Mae and Freddie Mac. Since these agencies are often the eventual destination of a conventional mortgage loan, the lender upholds the standards required to sell to those agencies. The actual requirements set by Fannie Mae vary based on a number of factors and can be found in the agency’s Eligibility Matrix. While specific minimums will depend on the Eligibility Matrix, the agency does stipulate the absolute bottom for acceptable scores for manually underwritten loans. Fannie Mae requires that borrowers of fixed-rate mortgage loans have an absolute minimum FICO credit score of 620, and borrowers seeking adjustable rate mortgages (ARM) will need a minimum FICO credit score of 640. Additionally, Fannie Mae requires that lenders obtain credit scores for all borrowers on the loan, and that at least two credit scores are obtained for each borrower. In the case that the lender pulls two credit scores, the lowest score is used. 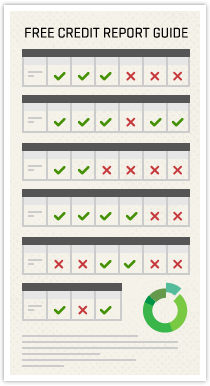 In the case of three credit scores, the middle score is used. And think twice before you apply with frozen credit reports. A single frozen credit report may be fine so long as the lender can still access your other reports, but if you have two or all three of your credit reports frozen, you will typically be ineligible for a mortgage loan. Can You Get a Home Loan with a Credit Score of 500 to 550? Although the lines between bad and fair credit scores can get blurry depending on the situation, a credit score between 500 and 550 is definitely in the bad credit score range no matter who you ask. But, having bad credit doesn’t necessarily disqualify you from owning a home. Based on the data in the previous section, yes, a conventional mortgage is pretty much off the table when you have a bad credit score (unless you have a cosigner with spotless credentials — more on that below). That leaves you government-insured loans as your only real alternative. In general, government-backed loans don’t have very high minimum credit score requirements. FHA-backed loans, for example, can be obtained with a credit score as low as 500, so long as you can provide the necessary 10% down payment. For a lower down payment, you’ll need a credit score of at least 580. That being said, the government agencies simply insure the loans — they don’t issue them. This means you have to contend with lenders, and each lender can set its own minimum credit score and down payment requirements. As such, you may have a hard time finding a lender willing to offer you a mortgage loan if your credit score is below 550. The best way to offset a low credit score is with a healthy down payment. The larger the down payment you can make, the more likely you are to be approved for a mortgage loan despite your bad credit. That being said, you may want to consider using some of that cash to pay off existing debt to boost your credit score instead of toward a down payment. Your local credit union may also be a good place to seek out a mortgage if you have low credit scores. Credit unions are less focused on revenue than big banks, as they don’t have boards and shareholders to whom they owe profits. How Do You Buy a House with No Money Down? One of the largest hurdles to homeownership is the down payment typically necessary to secure a mortgage loan. Borrowers who may be able to afford the monthly payments but have a hard time saving up 20%, 10%, or even 5% of the purchase price are often barred from buying a home. Unfortunately, the only real way to get a mortgage loan without a down payment is to qualify for either a VA- or USDA-insured mortgage. These types of loans are backed by their respective government agencies, which reduces the risk for the lender and allows for a low or $0 down payment. However, both types of loans have strict qualification requirements that must be met. VA loans, for example, are only available to active or retired military members (and, occasionally, their families), while USDA loans can only be obtained for eligible rural properties and also come with income requirements. Outside of government-insured loans, you may live in a state that offers first-time homebuyer assistance programs that can help you make your down payment. These programs can range from grants you won’t need to repay to programs that allow you to effectively borrow your down payment and repay it when you sell your home. If you can’t qualify for a mortgage with no down payment, the next best thing may be a loan with a low down payment requirement. FHA-insured loans, in particular, can be obtained with a down payment as low as 3.5%, as long as you have a credit score of at least 580 (though specific lenders may have higher requirements). Some conventional mortgages can also be obtained with a low down payment, but they will typically require good to excellent credit. One thing to keep in mind about mortgages with low down payment requirements is that they tend to come with mortgage insurance. This extra payment, usually tacked onto your mortgage payment, goes to the lender to help offset the extra risk associated with loans with a large loan-to-value ratio (LTV). To determine the LTV of a mortgage loan, you divide the loan amount by the value of the house. 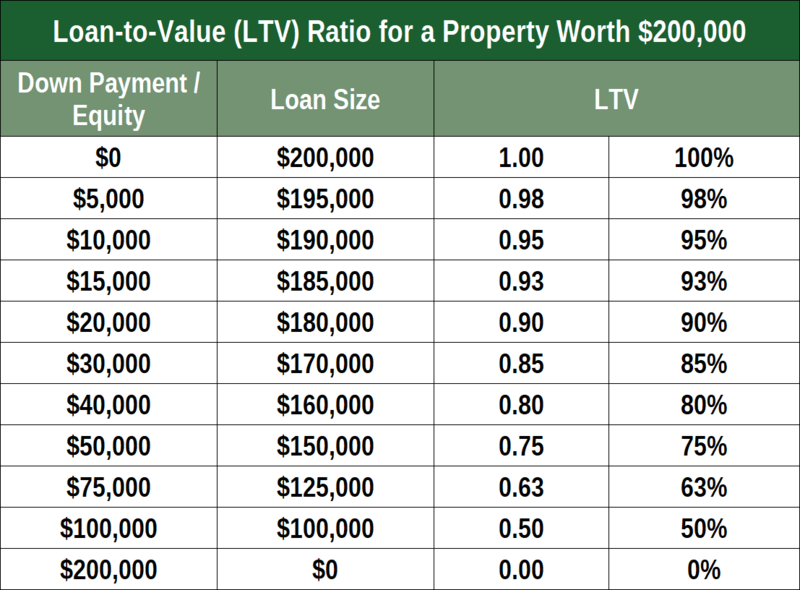 So, if you take out of a loan of $194,000 to pay for a house worth $200,000, the LTV is: $194,000 / $200,000 = 0.97 = 97%. The higher the LTV, the more risk to the lender. In general, you’ll need to pay mortgage insurance on any loans that have an LTV higher than 80%. Can You Use a Cosigner to Get a Mortgage with Bad Credit? At the end of the day, getting a mortgage comes down to risk. Home loans are usually in the five or six figures — which is a lot of money. While the loans are secured by the property they’re used to purchase, few lenders want to go through the bother of trying to sell a foreclosed property to get their money back. When applying for a mortgage, lenders will look at everything from your credit to your income to your current debts. If any of these aren’t up to snuff, you may be seen as too high risk to offer a loan. In some cases, a cosigner may help reduce your perceived risk and make it easier to get a mortgage. Some cases — but not all. To start, let’s clear up the difference between a co-borrower and a cosigner. 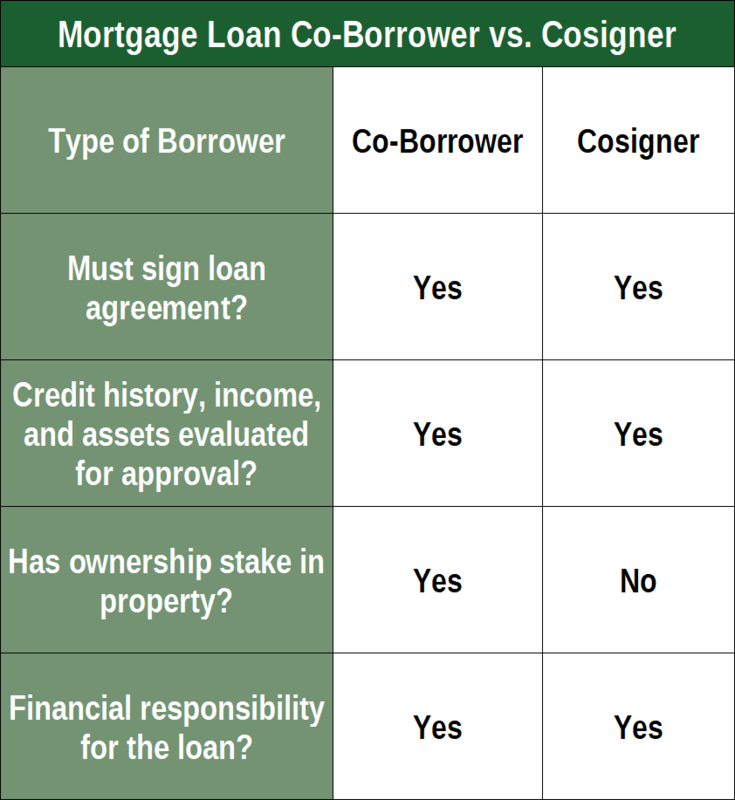 Both co-borrowers and cosigners are legally and financially responsible for the loan. In either case, the co-borrower or cosigner will need to sign the mortgage loan agreement and have his or her credit history, income, and debts evaluated as part of the application process. If you’re applying for the loan jointly with a partner or spouse, and both parties will own the home and contribute toward the down payment and mortgage payments, then you are co-borrowers. Co-borrowers have equal rights to the house — and equal obligations. Cosigners, on the other hand, don’t actually live in the home that the loan is used to purchase (which is why they’re often called non-occupant borrowers). That said, cosigners are still responsible for repaying the loan if the primary borrower or borrowers default on the mortgage. The loan will also count against the cosigner’s debt-to-income (DTI) ratio. Since the cosigner’s credit and income are included in the application, having a cosigner can certainly make up for certain shortcomings in your own qualifications. For example, if your income is below what is required for your loan, having a cosigner on your loan whose income can be incorporated may help you get approved. However, if the problem with your application is that your credit score is well below what is required, having a cosigner may not actually help that much. That’s because lenders will look at the credit profiles of everyone on the application. Moreover, lenders will often use the lowest credit score as the representative score, meaning your low score may be all they consider. Furthermore, asking someone to cosign a mortgage is a big deal. You aren’t just asking them for a small favor — you’re asking them to take financial responsibility for your mortgage. If you make late payments or, worse, default on your mortgage, your cosigner will be subject to the same credit damage you experience. Plus, they’ll have to start paying your loan to avoid more damage. Should You Use a Rent-to-Own Program? As you research your options for purchasing a home while you have poor credit, you’ll likely come across the concept of a rent-to-own real estate purchase. Basically, a rent-to-own purchase is similar to leasing a car in that you rent the property for some period of time — typically 12 to 36 months — before taking out a mortgage to purchase it. Depending on the contract, some portion of your rent may be put toward your purchase, which can make it seem less like you’re tossing your money into a void every time you pay rent. While a rent-to-own agreement can seem like an ideal solution for potential borrowers who have found their ideal home but who can’t quite meet the mortgage requirements, you need to take a good look at the pros and cons before you sign up. Lease Agreement with a Purchase Option: If your rent-to-own agreement has a purchase option, you have just that: an option. You can decide to purchase the property at the end of your lease — or not. If you choose not to purchase the house, the agreement ends and both parties can move on. Lease Agreement with a Purchase Agreement: A rent-to-own agreement with a full purchase agreement is basically the same as buying the house, except your closing date is a year or more away, rather than the standard 30 to 90 days. In this type of rent-to-own scenario, you are generally legally obligated to purchase the property at the end of your lease. When setting up a rent-to-own contract, you’ll need to make a few decisions upfront, including how the house will be priced. You can decide on a set purchase price based on the property’s current value, or you can decide to set the price based on an appraisal to be completed toward the end of your lease. If you’re in an area with rising housing prices, it may be a good idea to lock in the house at the current price. If the housing market declines, however, that option may end with you paying more for the property than it is actually worth when you buy it. Other aspects of the rent-to-own agreement will look pretty much like a standard lease agreement, such as the rental rate, who is responsible for repairs, and how long the agreement will last. You’ll also need to stipulate how much of your rent (if any) will go toward the final purchase. Additionally, your contract should clearly describe the conditions under which the contract will be considered broken or void. For example, most rent-to-own agreements will include a clause that says you lose rental credit for any month you make a late payment, or that multiple late payments in a row will void the contract entirely. Overall, rent-to-own agreements can have benefits and drawbacks. You should consider all aspects of the agreement before you enter into a contract. Time to build credit: A good rent-to-own contract can give you a year or more to work on building your credit so you can better qualify for a mortgage when it’s time to buy. Reduce your housing debt: Depending on your contract, some part of your rent and/or option fee may be put toward your purchase, reducing how much you’ll need to borrow at the end of your lease. Set purchase price: If the market is growing, locking in a purchase price may help you avoid rising costs. Settle in: You may find your ideal home before you’re in a place to purchase it. Rent-to-own can allow you to settle into your home while you work on building credit. No refunds: You can lose both your option fee and any rental credit you build up if you break your lease or decide not to exercise your option to buy the property at the end of your lease. Higher rent: Although some portion of your rent will likely go toward the final purchase price, you’ll be paying an average of 20% above the market rate in rent each month during your lease period. Must pay option fee: You will likely be required to provide a one-time, nonrefundable option fee. This fee is typically some percentage of the purchase price — 1% to 5% is common — and it is what gives you the option to purchase the property. Legally obligated to buy: If you’ve entered a lease-buy agreement, you typically must purchase the property at the end of your lease — even if you no longer want the property or can’t afford it. Locked purchase price: Locking in a low purchase price can be a benefit — unless the housing market declines. Then you’re still stuck with the higher price and no room to renegotiate. Untrustworthy sellers can cause issues: If the owner of the property decides not to sell, you could find yourself in a costly legal battle to get your contract fulfilled. Or, the owner could simply stop making mortgage or property tax payments, leaving you with a messy lien on the property or, worse, on the street after the house goes into foreclosure. As with most things in life, the success of a rent-to-own agreement can vary significantly based on the players involved. A very thorough contract can help prevent any number of issues from cropping up, but even a perfect contract won’t save you from some of the worst-case-scenario problems that can occur. If ever something were aptly named, it’s probably bad credit. A bad credit score can make everything more complicated — and more expensive. Especially when it comes to securing financing for new home. But, the one thing bad credit has going for it is that it doesn’t have to last forever. You can improve bad credit, and it may not even take that long. With some hard work and careful budgeting, you can typically boost a bad credit score high enough to qualify for a mortgage within a year or two. The quickest way to improve a bad credit score will usually be to pay down existing debt. Start with any debts on which you’ve fallen behind, then move to those debts with the highest utilization rates. For example, pay down any credit cards that have balances near their credit limits. Utilization counts for as much as 15% of your FICO credit score. After you’ve paid down what you can, simply focus on making on-time payments every single month. The longer you can go without missing a payment, the better your credit score will get. After six months of on-time payments, you should see a noticeable improvement in your credit scores, and a year of positive payment history will go a long way toward helping you qualify for new credit. How Do Mortgage Payments Affect Credit Scores?